Changing user behavior. It’s a dangerous game. Sometimes it works and you succeed, sometimes it doesn’t and you fail. More often than not, the latter is the case. It’s with this in mind that I approached the Novation Twitch controller for Serato Itch with caution. As a long-time DJ, coming from an analog world of records and turntables, it’s already difficult for me to get used to the idea of a controller versus a typical mixer setup. But when you take away my pitch faders, replace them with knobs and then tell me that I can touch a strip to slow down or speed up a track, that was enough to give me a bristling first reaction. But I’m an open-minded sort and I’ve dealt with Focusrite/Novation products in the past. I can’t say that I have owned many of them, but I’ve known them to be of high quality and so I had to give it a try. First off, it’s worth noting that the Twitch is far from the first controller made specifically for Itch. Other, capable ones have been manufactured from the likes of Denon, Vestax, Numark and Pioneer, but they’ve not been met with overly-enthusiastic reviews due to various reasons. One of the main complaints about most of the controllers that I’ve seen comes from their size. DJ’s are increasingly wanting to take controllers with them to gigs and having something that requires its own flight case takes us right back to Technics days. When you’re trying to move away from that, keeping gigantic form factors is counterproductive. So that’s where we’ll start with the Twitch, then we’ll move on to the other parts. The Twitch is a minute controller, measuring just shy of 14 inches wide, 11 inches deep and 3 inches tall. In the promotional video for Twitch, it seems that Novation is well aware of that selling point as it claims that you can fit Twitch into a DJ bag or backpack easily. For me, this was indeed a big selling point, as having a controller that I can pick up and take with me at will is important. Hot Cues: Each of the 8 buttons can be assigned to a different location in the track, playing from that location on demand. Slicer: Your track is automatically “sliced” into different sections, such as drum hits, horn stabs and high hats, effectively turning the 8 pads into a sampler with which you can remix a track on the fly. Auto Loop: The 8 pads control the length of the looped section, as well as the playing and stopping of it. Loop Roll: This feature allows a loop to be played while the track continues to play at the same time. Instead of exiting the loop, then going back into a track at the same point at which you entered, loop roll lets you re-enter the track at a point which will coordinate with the amount of time that you’ve played the loop. Moving up from there, you have the Touch Strip. In normal (Swipe) play mode, dragging your finger left will slow the track, while right will speed it up, quite akin to dragging your finger on a vinyl record, or pushing it forward gently. Press the button for Drop mode and the strip corresponds to the length of the track, allowing you to “drop” the play position to any point on your song. There’s a knob above the mode button to do fine control of your pitch, so that if your beat grid (a mapping of the beats of a track, allowing it to be tempo-matched automatically) is off you can still manually adjust the tempo at which it is being played. To the left of that knob are play/pause and cue controls, as well as a keylock button (for changing speed without changing pitch) and a Sync/Auto button which lets you synchronize the tempo of one track to another. Finally, above that, you have a beat grid section that allows you to adjust your grid on the fly, if you have time. But that’s where the left and right sides of the Twitch stop being identical. On the left top you have a section for master effects, whereas the right side has your headphone, booth and master gain controls. The right side also plays home to a section for browsing tracks, again all with a button or knob, so that you don’t have to touch your computer. The middle section of the Twitch is a 2-channel mixer, which operates as you’d expect. There are 3-section EQ controls, plus a trim control, and an effects selector for each channel. When activated, these channel effects levels are controlled by the volume fader for the tracks. There are a few things that set the Twitch apart from the rest of the crowd. First and foremost, that Slicer control is a true game-changer. If you’re playing any sort of 4/4 music, it works flawlessly. With more atypical time codes (such as Drum & Bass, for instance) it will still work but requires a bit more effort to make things sound as they should. The per-track effects are brilliantly done, and the built-in effects of Serato Itch sound great. The ability to layer effects, having each channel with its own and then another on top via the master, is quite welcome and surprising. I was skeptical about the touch strips, but using them feels surprisingly natural. LED lighting chases your finger, also letting you know that you are making changes to the track, and the left/right motion feels better than I thought that it might, considering that most of my touch adjustments to vinyl were more akin to up/down instead. Two headphone jacks are at home on the front of the mixer, giving you the ability to use 1/4-inch headhone adapters or to skip them (or keeping you playing if you happen to lose one). A left-side microphone input is nice, but I opted to use one on the back instead, as I didn’t have an auxiliary CD player or anything of the sort that would otherwise occupy the space. The Twitch feels great, overall. It’s compact, but the unit feels sturdy and solid, never wanting to go creeping across my desk as I tortured it for hours during testing. I have to say that I’m not a big fan of the hard plastic buttons which are used en masse, but the rubberized, softer ones feel great. Faders are long-throw and have a fantastic feel to them, even if there is a bit more left/right play than I’d like to see. The knobs have a great touch to them, with a firm detent at 0. They are a bit tighter than I liked at first, but broke in nicely after a few hours of play. LED backlighting graces most of the Twitch, and I wish it was a bit brighter. However, for most club conditions, it’s more than acceptable and it doesn’t have excessive lighting that can distract you from what you’re doing. The top plate of the Twitch is a solid piece of aluminum, a huge plus to me. I had griped a bit in my review of the Traktor Kontrol S4 about the plexi/metal marriage and the problem that joint grooves give. I hadn’t noticed, until moving back to a solid plate top, exactly how badly it annoyed me. The other factor that weighs heavily in my positives for the Twitch is the fact that it has dedicated booth and master outputs. 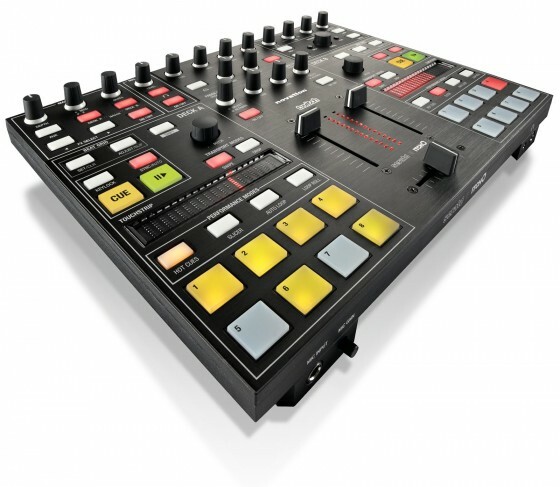 Though Native Instruments now has a 2-channel controller in the S2 that has the same, I’m still not sure how I feel about the rear-mounted booth control for that model. There’s plenty of room for routing cables underneath the Twitch, so if you’re using the front microphone jack, you’ll be able to run it under and out from the rear of the controller, rather than having it stab you in the stomach every time that you get close. Interconnects on the Twitch all feel incredibly solid. I’m quite fond of the high level outputs for the master, then having a set of RCA outputs for the booth. It’s also interesting to note that you can flip a switch and have your booth outputs run from the cue, rather than the master. The fact that the Twitch runs from a single USB interconnect for both audio and power is important. In fact, there isn’t even an auxiliary power plug available, but I tested the Twitch on 5 different laptops and never needed one. This is someplace that the Focusrite/Novation conglomeration will come in very handy. Focusrite makes audio gear, novation makes MIDI controllers. So, marrying audio gear with a MIDI controller is something that the company should be very good at doing, and the Twitch proves that to be true. Audio quality on the Twitch is top notch, as I expected it to be with Focusrite being behind the internals. I was hugely impressed with the Native Instruments audio quality on the Kontrol S4, and the Twitch meets that same level of perfection. Everything that I’ve run through the system sounds full, clear and clean. It’s also important to note that the Twitch can be used as a full-duplex sound card for your computer. My DJ workstation is also my desk, so for me this was an added bonus. Plugging a microphone into the rear port, I can run that into my computer and record TNW’s Daily Dose or TNW Sessions and I can control playback volume via the Master of the Twitch. It’s not something that’s a make or break for me, but it’s absolutely nice to have these abilities. Here’s where things get abundantly clear. The Twitch is a $500 MSRP controller. At that price, there’s absolutely nothing on the market that compares. Native Instruments’ Kontrol S2 came out at a $669 MSRP which I think is a huge mistake on the part of NI. 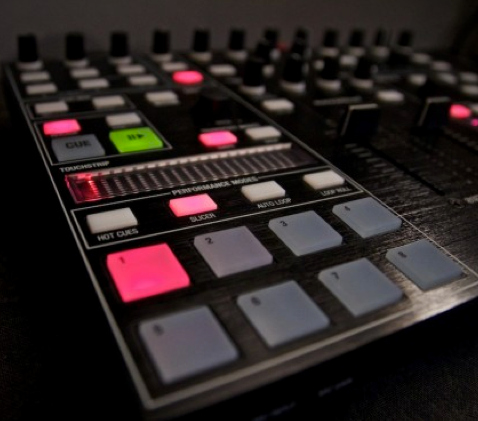 It could have held a really good shot at running with the Twitch, which also includes mappings and an overlay for 4-deck support of Traktor Pro, but the price just doesn’t add up. The other options on the market, for a Serato Itch controller, run the gamut from incredibly expensive to disgustingly cheap. Unfortunately, there isn’t anything in the lineup that is disgustingly cheap, but also very good. This is where the Twitch really shines. The short version of this wordy story is that the Twitch is a hugely capable controller, and it proves that changing user behavior isn’t always such a bad idea. The touch strip method works, and it works extremely well. By replacing the oversized, somewhat useless jog wheels that most other controllers are using these days, Novation has managed to make it smaller, lighter and yet still more robust than almost everything else on the market. If you’re a fan of Serato Itch, there’s absolutely nothing else you should consider. Given the included mapping for Tracktor Pro, it’s also quickly becoming my favorite controller for Native Instruments’ genius piece of software.